After my first trip to Luang Prabang in 2013, the main thing I hoped to follow up on was Katu backstrap weaving. It had been amazing to connect with backstrap weavers as a weaver, and I wished for more time with these young masters, Keo and Mone. Their skill level is astounding, the techniques and tools mesmerizing. As I wrote before, I tried my hand at warping and weaving in this way on my own, based on video documentation of Keo, and the results were less than impressive. I never posted the "finished" object here, because I had simply cut it off the loom when it got too messy: too many broken warps and tension issues. But when I knew I was returning to Luang Prabang, and that Mone was teaching weaving and I would very well have the chance to learn with her, I knew I had to show her my solo attempt. I packed the sad little sample (about 10 inches, woven off a 4 yard warp) along with gifts of merino bamboo yarn for Mone to experiment with, and couldn't wait to meet her again and learn to weave officially. When I met Keo and Mone and presented my sample, they exclaimed in disbelief: "You did this by yourself??" They were thrilled, happy, and proud, and wouldn't stop exclaiming and admiring my funny little piece. Mone said, "This looks like my first weaving!" It felt wonderful to finally share with them, because no one else in the world could appreciate the work that went into that sample. They honestly seemed to think it was good, and Mone was convinced I could try weaving a wider piece in her "advanced" class format. The good student in me swelled with pride - but more than that, I was basking in the fellowship of weavers, traditional master backstrap weavers who were acknowledging me as someone on a similar path of effort and skill. For what it's worth: this is my sample in its "finished" state. Mone now teaches half-day classes for beginners, preparing a narrow warp so her students can weave a cuff/headband/bookmark sized band with border stripes and beading (for information see The Weaving Sisters on Facebook. and their two Instagram accounts, Keo and Mone.) Katu weaving traditionally incorporates seed beads, which are threaded onto the weft and worked into place as each pick is thrown. Traditional weaving also has a variety of supplementary warp patterns, which I had tried and failed to make in my own warp. I had hoped that Mone would introduce me to those, but she said it was too advanced for me: "Next time," she told me with a smile. As a concession to my skill level, she allowed me to work on a wide piece, and to participate from the beginning, in winding the warp. My friend Sarah and I were learning simultaneously. Sarah had a pre-warped narrow band, and Mone got her started, then began making the warp with me. She explained that when two people warp together, they begin in the middle and work their way out, symmetrically. I'd chosen colors and we invented a stripe sequence as we went along, Mone telling me how many times to wind each color. She had to attend to Sarah's weaving intermittently, and introduce the beading process, so if I got ahead on my side of the warp, I would shift to her side and catch up. As a result, I can't say who warped which half of my piece. In addition, there was some confusion as to what she meant by her count - whether "3 times" meant three full rotations, or three lengths, for example - so there are some anomalies in the two sides that show not only that two people were warping but that they had different interpretations of the numbers (and I'm sure I miscounted at least once.) The whole process is recorded in the stripe pattern, a visual document of this teacher/student exchange. All of this happens in a small room, with the door open to neighboring chickens. Bowl of rambutan at left - our snack. The first time I was in Luang Prabang, asking Mone questions about the weaving patterns, she told me, "You need to stay with me for a month." I completely agree. Although I had a lesson that spanned a couple of days this time, and I got to warp and weave a whole piece by myself, there is still so much I couldn't learn in that time. Leaving aside the more advanced techniques of supplementary warp, there are countless small habits, in the winding of the warp or the use of the loom, that she may not even think to mention because they're second nature to her now. Mone is an excellent teacher, and she conveys the basics very clearly, giving pointed guidance while reassuring students, "You're just learning! This is your first piece - you're doing great!" But on the subtle level, anyone who has honed a skill from childhood has trouble breaking it down into every step involved, and that's why I'd need at least a month to pick up on all the details. It was invaluable to weave with her for two days, and to hear tips that changed my whole approach. Having tried this myself, unsupervised, I'd of course developed my own habits, work-arounds that were not necessarily helpful, and being observed by Mone and Keo, it became obvious very quickly which habits were not acceptable to them. In short, I wove with masters, and I'm very grateful. I'm opening the heddle shed (the trickiest part) while Mone twists fringe on a finished piece. Her fringe twisting technique is another valuable lesson learned. Working toe-to-toe. Mone is finishing up the beading section on Sarah's band. One of the main bonuses of the advanced class is that you get to keep the loom. This was very exciting to me, since I'd experienced my own jerry-rigged version, and knew the importance of the particular shape of the sword beater and the smooth bamboo elements. The bamboo has been shaved by hand so that it's completely smooth, and the sword beater was hand-carved by Mone's brother from a Burmese type of mahogany. I took the weaving back to my room, and worked on it whenever I got the chance. I wanted to be sure and learn some beading before I finished, although I knew I didn't want to bead the whole length - for a beginner, it takes way too long. Mone got me started on a diamond pattern, which I copied. Then Keo told me to try the filled diamond (more beads = more difficult), then for the last one I tried a more open diamond, skipping a row between beads. Here's my finished piece, back home in the US. For some reason, it got very narrow at the beaded end. Mone recommended that for my next solo attempt, with my new loom, I should weave a narrower piece, to practice and get used to the loom. I had purchased some of the fine cotton that is available in the Phusi Market in Luang Prabang, and that Mone uses double-stranded as warp and weft. Soon after I returned home, I set out to make a new warp while the process was fresh in my mind. I was thinking about acquiring 2x4's to make the warping frame, when my gaze fell on this wooden ladder.... for the current purpose, it worked just fine. Making a warp using a ladder as frame, in my own studio. I'm off and weaving again. The one mistake I made was to make the warp a bit too short. It fits my legs exactly, without rolling onto the bar at all. And the way these bars are made, a piece of bamboo split in half lengthwise, it's meant to be rolled on a bit. So the warp length on the frame should be longer than my hip-to-foot span. Since it's a circular warp, the actual woven length will be double that: the top half is woven, and the warp is advanced by rotating it on the bars. The next step is to shop for beads to use in the middle of this band. The rigid heddle opens up a different realm of possibility. I began with a warp of indigo dyed handspun cotton from Laos, with some of my handspun singles as a center stripe. The textured row is a cabled yarn I spun. 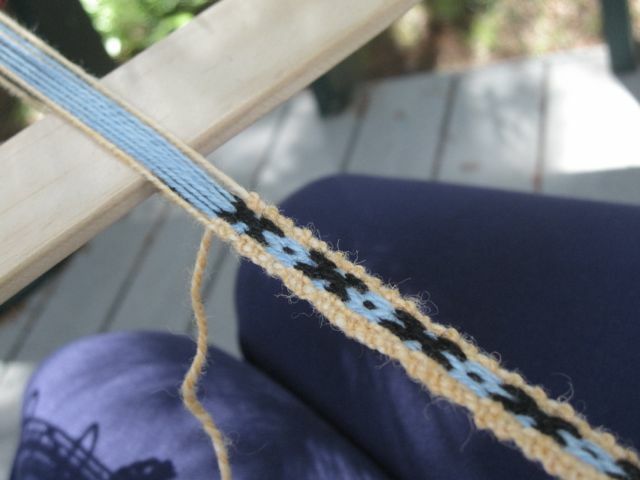 I hadn't been thrilled with it, but while using it in this weaving I became more enthralled. While it was relatively unconsidered, this warp turned out to be something that would not work very well at all on a backstrap, so it was a good choice for my first RH weaving. All those Lao cotton singles are irregular, and countless warps broke during the weaving. With irregularity as a feature, I was able to just keep tying on a new length of warp, and the blips in my own handspun added to the rustic texture. It finished out at a good size, loose but smooth, and I loaded up the end with cabled handspun, since I had budgeted it too strictly in the striping. 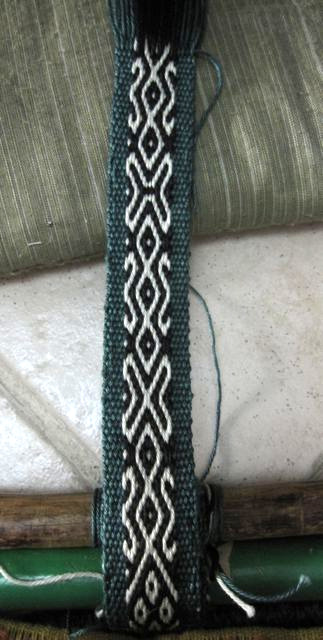 In addition to the Katu style foot-tensioned weaving, I have recently started another Andean pickup piece. This is a technique I first tried exactly two years ago, in January of 2011 (right). 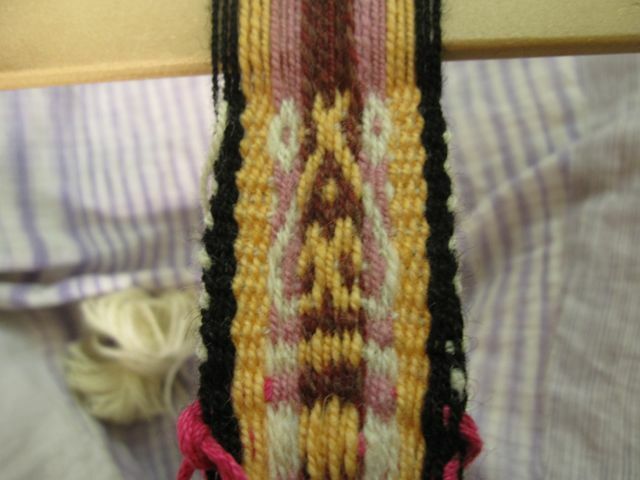 The first pickup weaving was an exercise from Laverne Waddington's Andean Pebble Weave book, and I had used her excellent tutorials to learn how to set up a backstrap loom in the first place. Improvising with spools of thread to hold the cross, I made several narrow bands which became bookmarks or keyfobs. 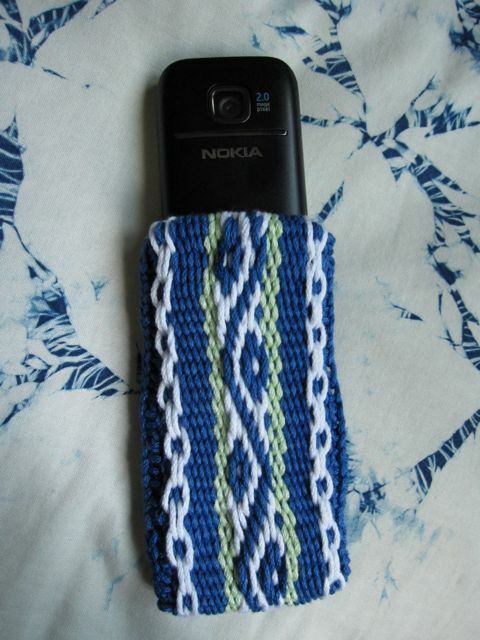 When I became bold enough to go wider, I could weave phone covers, still using charts from Laverne's book. So far, I was using cotton commercial yarn and following charts, not knowing the names of the designs. But my original introduction to this kind of weaving was still hovering in my mind and in a small unfinished bundle. In 2010 at the Golden Gate Fiber Institute (GGFI) Summer Intensive Retreat, Abby Franquemont had warped up a spontaneous, late-night warp with 6 pairs of pattern threads, and had begun to teach a traditional weave pattern. It was late and I had to thread a loom for Judith's class the next morning, so I could not spend much time at the moment, but I took home the warp and worked on it once in a while. Being very small-scale and silk, it was fussy, but I eventually learned that this is a crucial design, with which young Andean weavers begin. It gives them the basic concepts and principles on which their weaving will build. For this reason, I decided I'd better work one that I could finish. The pattern is tanka ch'oro. 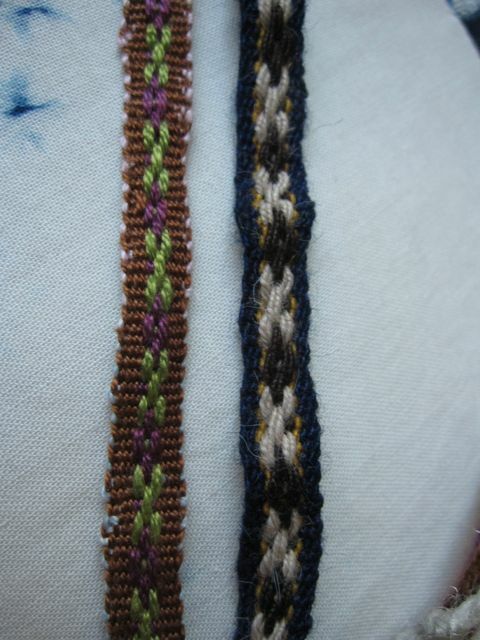 On the left is the silk warp Abby made, with my attempts at weaving. On the right is an actual tanka ch'oro jakima (the quechua name for the narrow woven bands) from Chinchero village, Peru, made with handspun yarn. The Chinchero jakima was given to me by Laverne, and is one of my most prized textile possessions. Over an embarrassingly long period of time, I worked on my own handspun tanka ch'oro, finally completing it in Laos last May. But meanwhile, I had been working on other pickup bands, expanding my knowledge of the patterns and how they are learned and created. I wove a long strip of maya q'enko, a winding river design, in cotton. I also learned and practiced the S curve, or kutij, which is in Laverne's lessons. When Abby noticed that I was trying to master designs, she suggested warping 16 pairs of pattern threads and doubling the mayo q'enko or kutij. This set me on a path of exploration that led to understanding what Ed Franquemont meant when he wrote about Andean weaving design as jazz. So the current weaving is a return to this experiment and ongoing tutorial after a hiatus, this time with handspun yarn. Plodding along with the foot-tensioned backstrap. Not that it isn't engaging for me, but the images may not be very thrilling for the viewer, since the view hasn't changed much. Possibly some improved selvedges. In the interest of variety, I'm including some action shots. The shed only opens as wide as the shed stick (about an inch), and the sword feels its way through, checking that all the warps are in the right place. Yes, I'd agree it's rather messy in there. My body is learning the movements, and things are becoming smoother. Certain issues are part of the original warping and cannot be resolved, only tolerated. Next time I will know better. Meanwhile, the fabric grows, inch by inch. 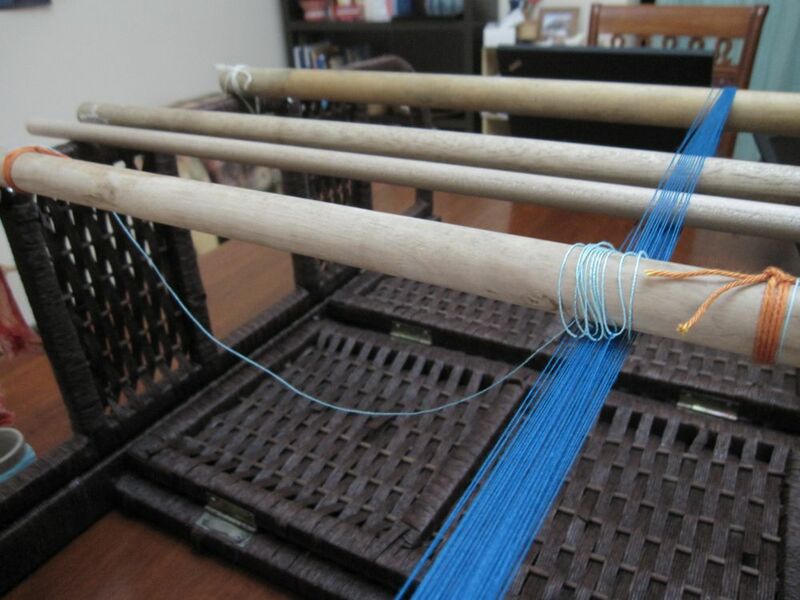 I set out to try to reproduce the Katu style foot-tensioned backstrap loom I observed in Laos, and I'm weaving. But there's an awful lot that I'm not doing right. However, trying out a technique that's 2000+ years old is a thrill in itself. Katu is the name of a group of people in southern Laos. The women traditionally weave on a foot-tensioned backstrap loom. Evidence of this style of loom dates to the first or second century BC; figurines found in the Shizhaishan excavation in Yunnan show women working such looms. 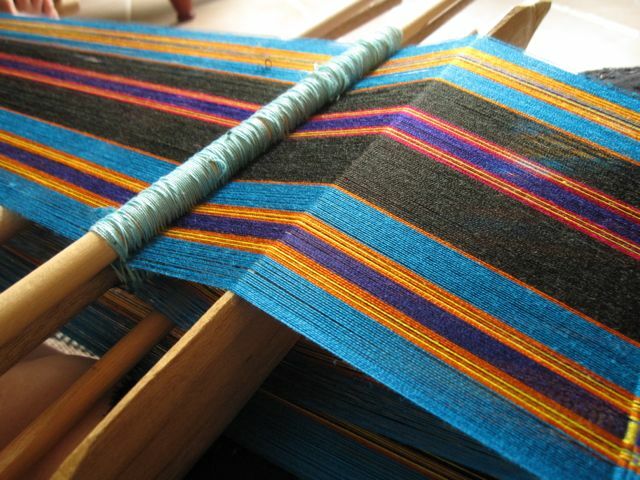 There are contemporary foot-tensioned backstrap weavers in various parts of Southeast Asia, including Vietnam, Laos, Cambodia, Hainan Island, and Taiwan. I first saw this type of weaving in person in Luang Prabang, Laos, at the Ock Pop Tok Living Crafts Centre, where two sisters from Salavan Province, Keo and Mon, were visiting artists at the Living Crafts Centre, and were happy to share their traditional expertise with me and the many travelers who visit the centre. Here is Keo working on a weaving. The length of the warp is rolled up on two warp beams (see below for their shape), and a cord straps these on, across her back. The tension of the loom is controlled by her feet and toes, flexing, releasing, and micro-adjusting. I spent hours watching, taking photos, and filming her in action as she wove in beads and warp float designs. As a backstrap weaver, I was fascinated by every detail, and tried to keep track of her changing of sheds using three different shed sticks, a string heddle, and a supplementary string heddle. All those different sticks control the designs that emerge in the warp-faced stripes. And none of them has a safety line to hold the stick in the warp - it's all up to the weaver's control. Here's some footage of the workings of Keo's loom. The warp is circular, with only the upper half of the warp threads being woven. To rotate the warp and move her work, she opens it up and rolls it again, clamping the warp between the cloth bars. 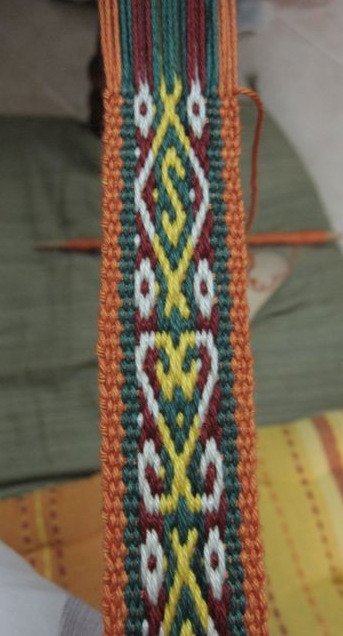 The tubular state of the weaving can be seen when she's finished. When she opens it up to rotate the warp, we get a view of the cloth beams, which are bamboo bars cut lengthwise, with prongs on the ends for the backstrap cord. I recently saw the same design in an article on this type of weaving, which was showing 19th century looms from Taiwan (Vollmer, J. E., 'Archaeological and Ethnological Considerations of the Foot-Braced Body-Tension Loom', in Studies in Textile History. V. Gervers, ed. Toronto, Royal Ontario Museum, 1977). This split bamboo bar with prongs on the ends is a highly specialized aspect of the loom, and I was struck by its consistency across cultures and time. 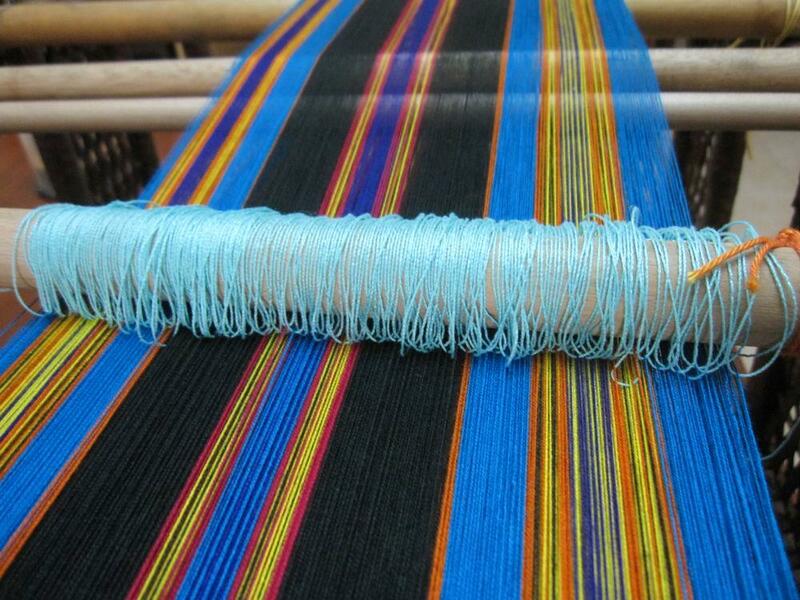 Keo uses a horizontal warping frame that is half the length of the finished weaving, about 2 meters. She walks the warp yarns back and forth on this frame, also creating the sheds and string heddle as she makes the warp. I was able to watch and video one warping session, and when I got home I was determined to try the same kind of set-up. It wouldn't even work to use my typical 3 or 4 bar warping method, so I had to invent a different system. Here's the warping frame in my apartment in Doha, two wicker bookshelves lashed together on top of two tables, end to end. This gives me 2 meters of warp. The cloth and loom bars are also lashed into place, and I arranged the shed sticks and heddle while referring to my photos and videos from Keo's warp. There were a few things I didn't see in person, such as the warping of the pattern sheds for the warp float designs. For this reason, I did it completely wrong and had to abandon the idea of supplementary warp pattern in my first Katu-style weaving. I also made a mistake on one of three bands of alternating colors. Generally speaking, my warping improved as I moved across from right to left, and this is directly reflected in the weaving. The heddle is made during warping, going under the appropriate warp yarns and over an extra-large bar that acts as a placeholder, so that the heddle strings will be long enough. This bar is removed before weaving, and a narrow one remains. 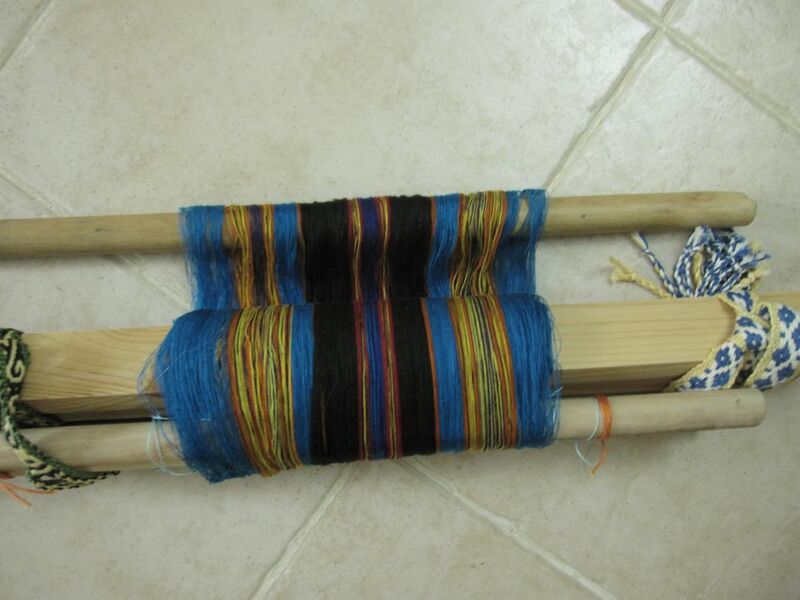 The finished warp is rolled up, with one end clamped between two bars (mine are square, while Keo's are two halves of a bamboo). This is how the warp is kept whenever it is not in use. To weave, it is unrolled on the legs, the backstrap is tied from the cloth beams around the back, and the feet tension the warp beam. To begin weaving, Keo unrolls the warp, attaches the cord around her back, and positions her feet to hold the warp bars. Note the multiple shed sticks, which are used to create warp float patterns. This warp has not been woven at all yet - she's just setting it up. See also the traditional beaded Katu sarong laid across her legs as she works. Trying to get the hang of it - first time in the new loom.